For most of the months Dec-Feb (2010-2011) I recorded the times I left for work and the times I got there (excluding days that I stopped for gas etc). I took almost exactly the same, route each trip, driving from my personal parking spot next to my apartment to the same spot in my office lot. 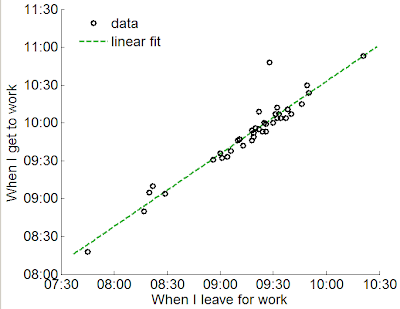 I worked from home on snow days (except for one ... see the outlier). I usually covered the clock in my car so I could not be biased into a different driving pattern. The curve fitting was done with my log fitting Matlab program (which you should all download if you ever need to fit a scatter plot of points to linear, exponential, logarithmic or power law curves). The slope of the line is 0.9589 which is very nearly 1. 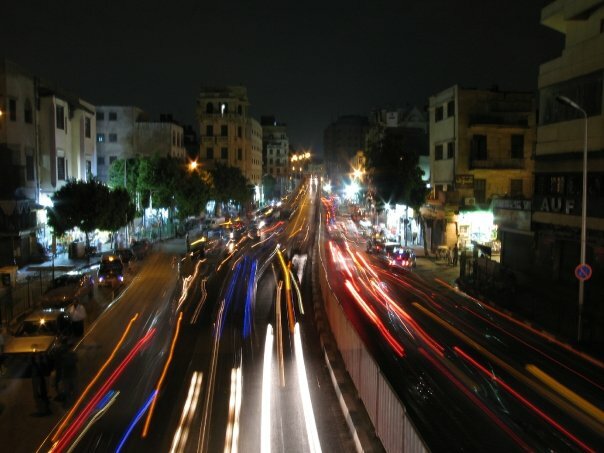 This means that for these months that traffic had a surprisingly small effect on the driving times. This goes against my intuition and anecdotal experience of it taking longer to drive in when I leave during rush hour (8-9). I think part of the reason for this is that I took a good chunk of these data during the winter break of a few universities, so traffic would have been lighter than usual. Also, I don't have enough data to get a good error bars around these numbers. I'd expect traffic to be less predictable during rush hour. Was this in the Grandma-moblie or new car? Also, are you still collecting data? 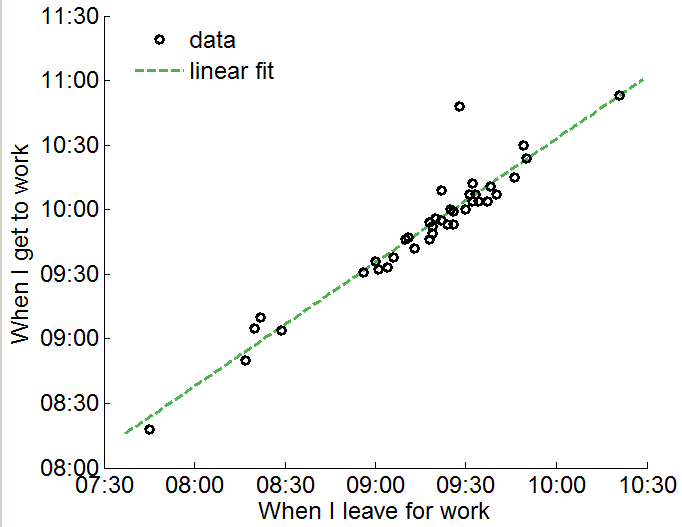 I think a better way to plot the data would be to plot total time (arrival time minus departure time) vs departure time. You could then better test whether the time it takes depends on when you leave. (ie. do a t-test to test whether the slope significantly different from 0). The way the data is plotted now would be better for testing whether your departure time is correlated with your arrival time (which it should be pretty obvious that it is). Another thing you could look at is whether the variance changes depending on when you leave (ie, bin the departure times into, say, 5 or 10 intervals, and plot std dev vs start time. ), though it looks like you might not have enough data for the earlier bins. @Avi, I did plot the bins to see if std varied as I expected it would - but there was not enough data in the end. I did do the other plot you suggest, the effect wasn't too strong, but you are right I could use it to test for significance! ... stay tuned.